A complete list of our guidelines. 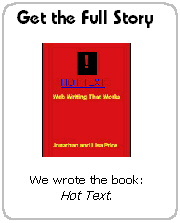 The gist of our recommendations on web writing that works. Why we think you ought to talk like a human being, even when you represent a large corporation or organization. Why we're glad to wave goodbye to documents, and welcome objects. We ramble, we pull in research, we make the case for changing the way we write for the web. Indulge our rants. We must work within consistent, formally defined structures when we write in a content management system, using XML. That's good. Here are models for a wide range of genres. We think you can do a better job with the lowly FAQ, if you work consciously with a model. Plan your labels, too, embedding customer assistance. Create step-by-step instructions that any fool can follow.